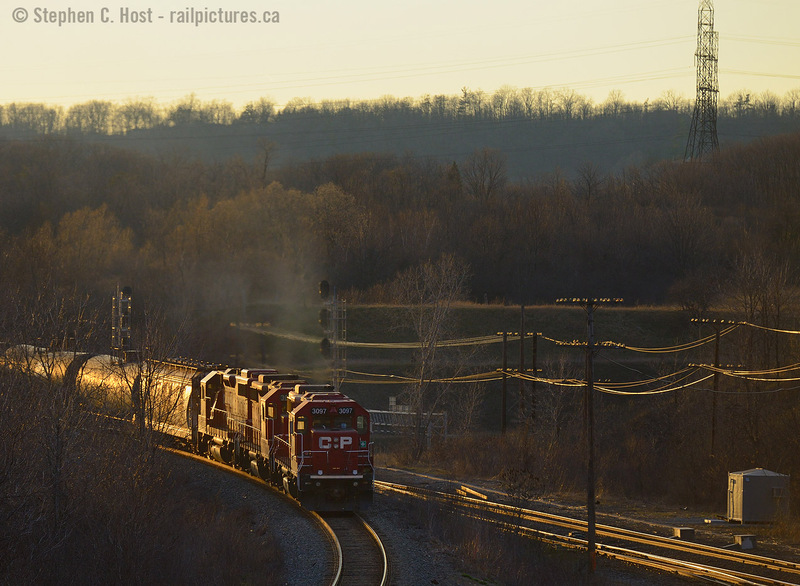 Railpictures.ca - Stephen C. Host Photo: Ontario’s pusher territory still continues At last light, three gp38-2′s in notch 8 fill the air with the sounds and smells of diesel engines doing what they do best – shoving an ethanol train up the Waterdown hill. When this started in 2014 the operation seemed clumsy as some crew needed familiarization with the procedures (while others did not). These days the crews have it down to a science and they are efficient and swift with the adding of, and application of pushers in this relatively new pusher district. Nice show boys, keep up the fine work! Considering both CN and CP regularly use pushers at this very location, Hamilton West is definitely the place to be, as it was 50 years ago in the days of steam (Anyone have vintage pusher shots from here? Please share! cheers!) | Railpictures.ca – Canadian Railway Photography – photographie ferroviaire Canadienne. Caption: Part deux of the pusher series: Ontario's newest pusher territory continues: At last light, three gp38-2's in notch 8 fill the air with the sounds and smells of diesel engines doing what they do best - shoving an ethanol train up the Waterdown hill. When this started in 2014 (click for photo) the operation seemed clumsy as some crew needed familiarization with the procedures (while others did not). These days the crews have it down to a science and they are efficient and swift with the adding of, and application of pushers in this relatively new pusher district. Nice show boys, keep up the fine work! And another shot from March 2014 a few weeks after it all began.